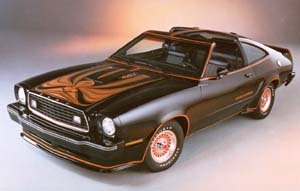 Ford Mustang II. 1974–8 (prod. 1,116,199). 2-door coupé, 2-door fastback. F/R, 2302 cm³ (I4 OHC), 2792 cm³ (V6 OHV), 4949 cm³ (V8 OHV). An attempt to get back to basics. Bulk of 1973 Mustang discarded; all-new model returned to sensible size. Styling inspired by model from Ghia of Italy. Lee Iacocca, now Ford president, targeted the segment heading to smaller cars such as its own Capri and the Toyota Celica (A20); the fact the Mustang II came out in the wake of the first fuel crisis was fortuitous. Four-cylinder engine considered weak; no V8s till 1975 (the classic 302 in³ unit); car needed structural changes to accommodate the V8. Heavy, cramped (shorter wheelbase than Celica, but longer overall), not that great a handler, and ignored by many collectors, though it has its own 1970s’ style and was incredibly successful for Ford in its early years. Emphasis on luxury in Ghia models, as Iacocca saw the II as a ‘little jewel’, built to high standards. Some Mustang features found their way into the Pinto. Cobra II trim in 1976, T-top in 1977, King Cobra in 1978, though more style over substance in all these cases.